Chlamydospores on and in bay leaf tissue (9 days after inoculation). 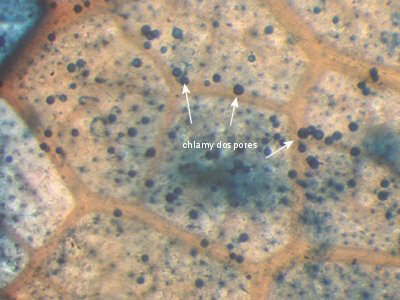 Leaf tissue was cleared and stained to reveal chlamydospores, which appear blue in this photo. 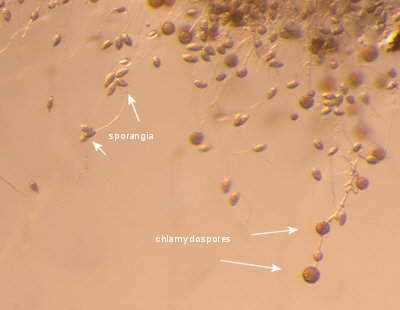 Sporangia (both discharged and non-discharged), and immature chlamydospores from a bay leaf 48 hours after inoculation. 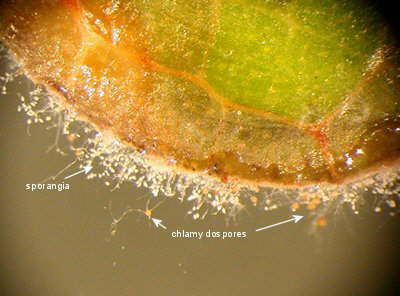 Close-up of sporangia (football-shaped structures) and chlamydospores (larger, round, amber-colored structures), 7 days after inoculation of bay leaf disks. 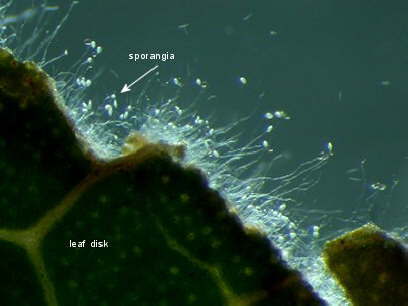 Note that some of the sporangia are empty, having already released zoospores. 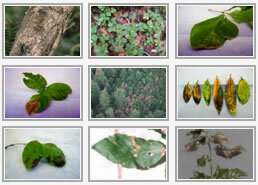 Phytophthora ramorum sporulating on edge of bay leaf disk, 7 days after inoculation. 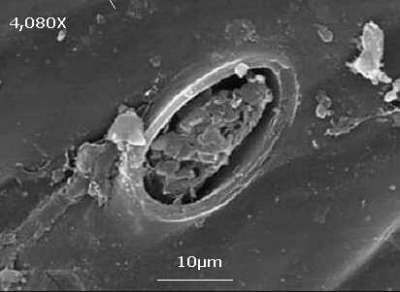 Abundant sporangia and chlamydospores are present. 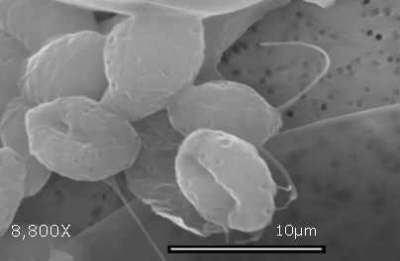 Mature chlamydospores are amber-colored. Sporangia on a bay leaf disk, 24 hours after inoculation. 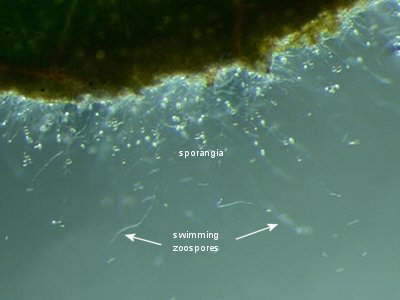 Zoospores are being released from the sporangia (the swimming zoospores appear as streaks in this photo). 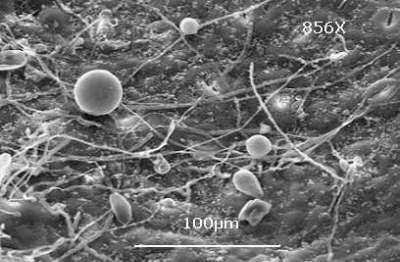 Sporangia of Phytophthora ramorum on the edge of a bay leaf disk, 20 hours after inoculation. 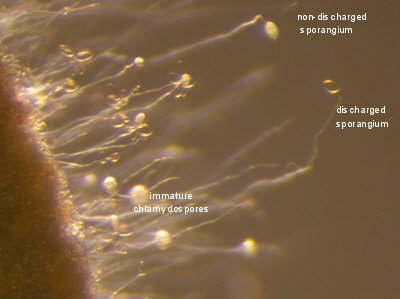 High magnification of single Chlamydospore showing further lack of ornamentation. 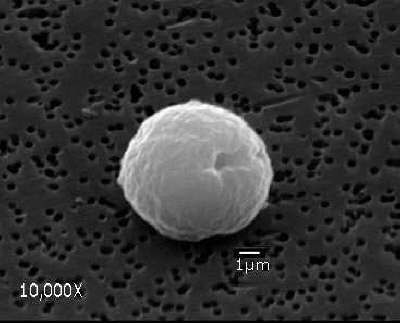 Chlamydospores: Spherical structures with little or no surface ornamentation and averaging 42µm in diameter. 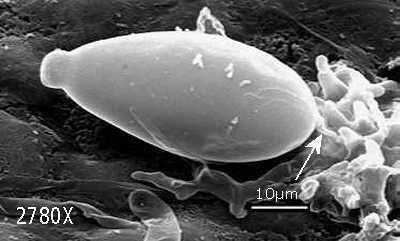 Photo Credits Edwin R. Florance Ph.D.
Higher magnification of single chlamydospore to indicate further lack of surface ornamentation. 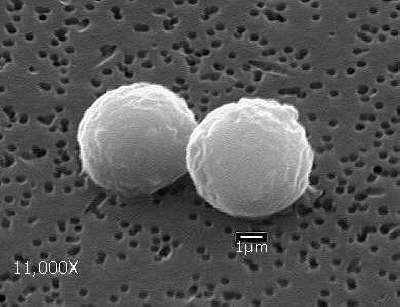 Chlamydospores: Spherical structures with little or no surface ornamentation and averaging 42µm in diameter. 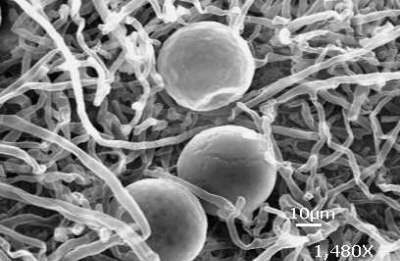 Chlamydospore surrounded by hyphae. 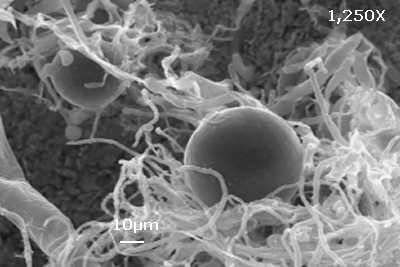 Chlamydospores: Spherical structures with little or no surface ornamentation and averaging 42µm in diameter. 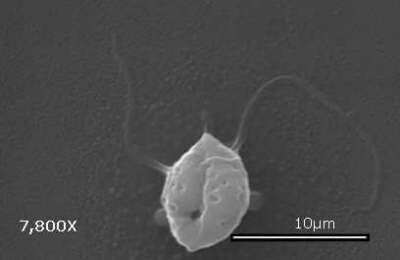 Chlamydospores; Note lack of surface ornamentation. 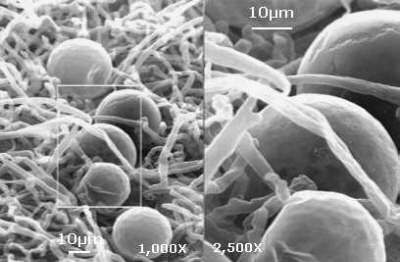 Chlamydospores: Spherical structures with little or no surface ornamentation and averaging 42µm in diameter. Chlamydospores, varied magnifications. 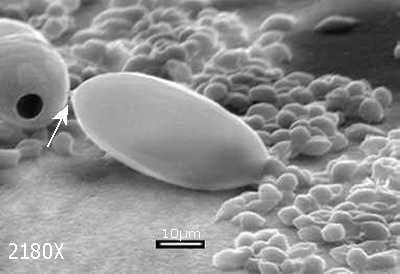 Chlamydospores: Spherical structures with little or no surface ornamentation and averaging 42µm in diameter. Lower surface of infected California bay leaf, Umbellularia californica. 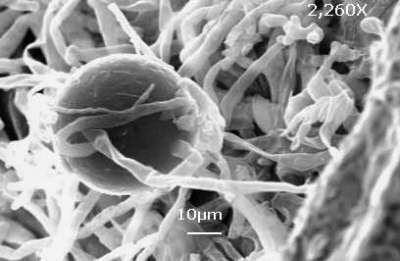 Note chlamydospore, zoosporangia, and hyphae. Infected tissue in tanoak (Lithocarpus densiflorus). 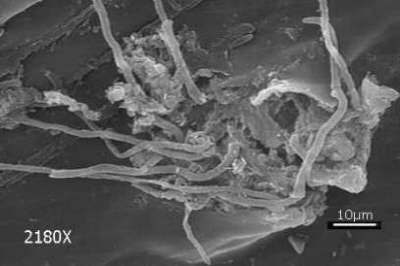 Note the nodulated hyphae of Phytophthora ramorum. Lenticel. 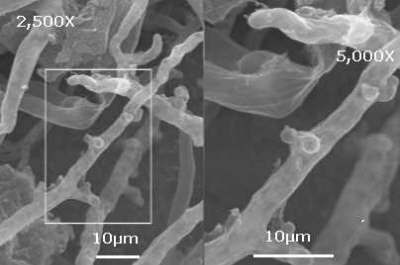 Special structures in the periderm of the stem that allow for gas exchange. 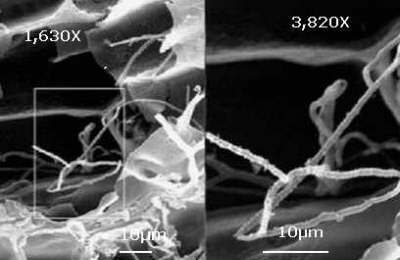 They are oval and average 37.67µm long by 20.2µm wide. P. ramorum cyst. Cysts of P. ramorum average 5.5µm in diameter, spherical, display an undulating surface, and depending on the stage of development the closing longitudinal groove is observed as a pore. P. ramorum cysts. 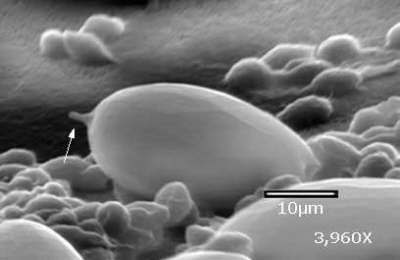 Cysts of P. ramorum average 5.5µm in diameter, spherical, display an undulating surface, and depending on the stage of development the closing longitudinal groove is observed as a pore. 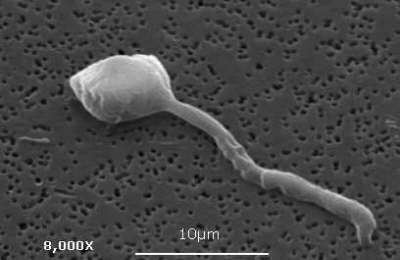 Zoosporangia prior to zoospore release; note pedicel (arrow). 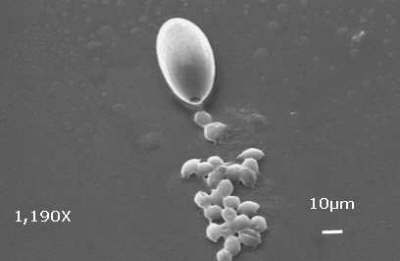 Zoosporangia after release of zoospores. Note pedicel (arrow). Zoospores from pure culture. 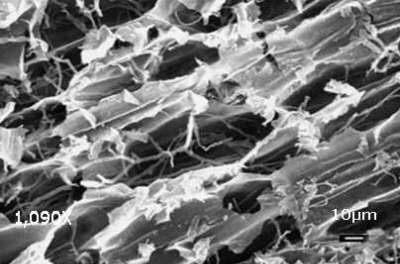 Note the biflagellation, reniform shape, longitudinal groove, and pitted surface. 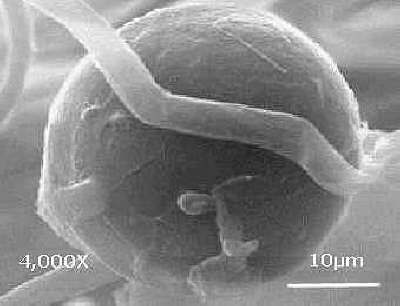 Zoospore from culture. Note the biflagellation, reniform shape, longitudinal groove, and pitted surface. 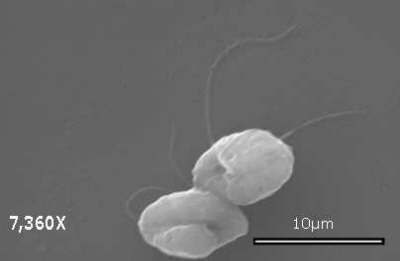 Zoospores from culture. 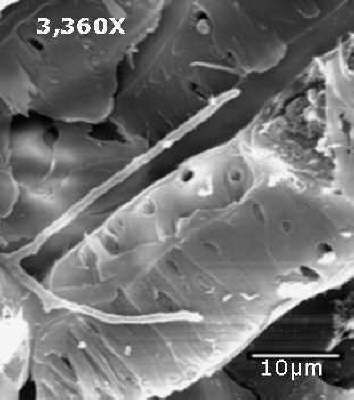 Note the biflagellation, reniform shape, longitudinal groove, and pitted surface.